Throughout Module 7, students build upon their measurement skills as they relate multiplication to the conversion of measurement units. 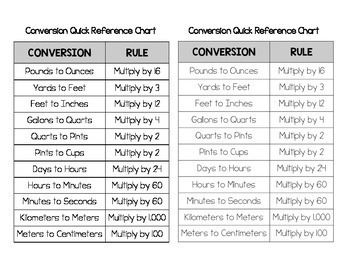 This quick reference conversion chart is the perfect tool for helping your students solve measurement problems involving unit conversion quickly and confidently. I recommend printing this conversion quick reference chart on cardstock or laminating for student use. You may also want to provide your students witan extra copy to keep at home so they can reference it when completing Module 7 homework assignments.